**If you cannot find an answer to your question in our FAQ's: Click here to give your feedback. Confirm your registration: Click here! 1. How soon will Eisenhower Middle School be rebuilt? Ground-breaking will be in the Spring Semester of 2018; building should be complete during the 2019 school year. 2. Why did the district leave several million in undesignated funds in this Student Investment Program (SIP)? Two major hurricanes hit the United States in the weeks prior to filing the bond, so at the last minute we adapted the bond language to provide a little flexibility. A similar circumstance occurred when Katrina coincided with the 2004 Bond, driving up construction costs astronomically, and not all projects were completed. We have a long list of projects ready for those funds, but we need to ensure that unexpected cost escalations for Eisenhower Middle School and safe rooms do not create an unexpected problem for the district, as Katrina did over a decade ago. About 15% of the entire SIP is not committed to a specific project, which should ensure that we finish everything as promised. We have $60 million dedicated for safe rooms and EMS, and the last thing the district wishes to happen is Hurricanes Harvey and Irma to cause us to fall short. This is the responsible move under the circumstances. Our Architects have a strong record with on-budget and on-time projects, but even they have advised us that Harvey and Irma are wildcards that no one can predict. They have already witnessed projects bidding much higher than predicted. Anyone who has ever built a house or significant project understands the need to be very conservative in pre-bid estimates. This is the reason for the “contingency” funds in the SIP. Once EMS and safe rooms are bid, we will use those funds for needs as identified by our local Principals and Site Bond Teams. Those funds will be audited by a state-approved auditor, reviewed by the Board of Education monthly, and reviewed twice each year by our Bond Oversight Committee. 3. Does the district need four middle schools? Yes. The board discussed the possibility of reducing to three middle schools, but district enrollment has stabilized or grown in early grades. We could not reduce to three middle schools without severe hardship on LPS children. The Board of Education openly discussed a myriad of options over the course of several board meetings. Options considered by board and administration included using other buildings (like old K-Mart), or Douglass as a 6th grade center if we eliminated EMS altogether. After reviewing all options and available information, the Board of Education determined that relocating 900 students (the current population of EMS) into the other three middle schools was not in the best interest of the district or community. The widespread disruption to students is something the Board wishes to avoid, and there is no other mechanism available to the Board to build a new EMS without a school bond. 4. Does the district plan to close any more schools? No. We have no need to consolidate any further. Moving our Pre-K classes into the sites has made elementary schools quite full. 5. What happens to Eisenhower Middle School students if the bond fails? The district will immediately draw up plans to move students out of EMS over the next 18 months. 6. What about Lottery Funds? The Lottery projections were never reached for several reasons. a.Oklahoma’s Sovereign Native American Nations and Tribes reached an agreement with the state for Casino gambling soon after the lottery started. Gamblers seem to prefer casinos. b.Higher Education bonded its funds up-front, and when the proceeds did not deliver, the bond payment still had to be made, leaving less for public schools. c.The lottery projections were based on very unrealistic numbers, in many people’s opinions. d.Bottom Line: Lottery Tickets are not selling very well. 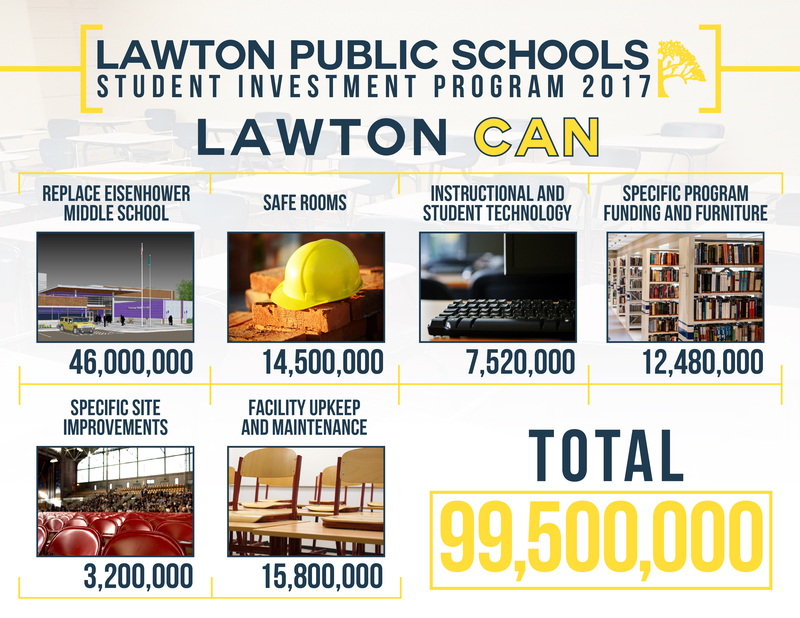 Lawton Public Schools received less than 1% of our General Fund Budget from Lottery funds. 7. How do school bonds work and what measures are in place to ensure the funds are spent properly? The best way to understand is to watch our video. 8. Which buildings will be the first to received safe rooms and how did the district decide? Watch our video. 9. What does the category include that discusses furniture and program equipment? 10. What type of student and classroom technology does this bond provide? 11. What are the plans for Eisenhower Middle School? 12. What other options were discussed for Eisenhower Middle School? 13. Does the Board intend to use any remaining or unobligated funds to build a stadium or sports complex? No. A new stadium would cost at least $20,000,000 and would take years to plan. In fact, the bond language specifies improvements to the secondary athletic facilities and Ron Stephens Stadium because a stadium is not possible for years to come. The district has openly discussed the possibility with various entities, but there are no funds nor land for such a project. 14. Will this bond guarantee a 1:1 model for the entire district? No. There is not enough funding in this proposal to achieve that, and 1:1* may not be appropriate for all grades. It will, however, move us closer to that goal and provide an unprecedented number of student-level devices for LPS students. As the district adopts and implements BYOD (Bring Your Own Device) policies, however, we could achieve 1:1 functionality. 15. How will the district ensure that funds are distributed equitably across all of the sites and that all sites are involved in the process? District and site committees will ensure that funds are equitably and efficiently used to provide the greatest impact possible to our students. 16. How soon will the district start seeing results? This will not be an overnight transformation of the district, but within the first 3-5 years, our students and programs will see a tremendous infusion of equipment and technology – as well as a premier middle school and safe rooms. 17. Will the school safe rooms be available to the public when the schools are closed? We do not believe FEMA allows this to happen due to concerns about people traveling during severe weather instead of sheltering in place for safety. 18. Does the City of Lawton run Lawton Public Schools? No, the City of Lawton has no oversight or governance of Lawton Public Schools. LPS is entirely independent of the City of Lawton. LPS is governed by its own board, policies, and state oversight. 19. What is the term of the bond issue? The bond issue is an 11 year bond. Please see this document to see how it impacts your property taxes. 20. Will the safe rooms accommodate all of the students and faculty? Will the safe rooms be built according to FEMA standards? Yes, the safe rooms will accommodate the entire population of that site. The safe rooms are designed to FEMA-361 and ICC-500 guidelines for our region. 21. Who can vote in this election? Any registered voter whose address is in the Lawton Public Schools district may vote in the bond election. 22. What is the role of the District-Wide Committees? 23. Why does the official ballot for the 2017 LPS bond issue not include detailed information about how the $99.5 million will be spent? Oklahoma’s constitutional statutes include specific and strict standards on the wording of ballot measures. The ballot title that offers a neutral summary about the specific components of a proposed law or program has to be written in 200 words or less. Shall not contain language whereby a “yes” vote is, in fact, a vote against the proposition and a “no” vote is, in fact, a vote in favor of the proposition.